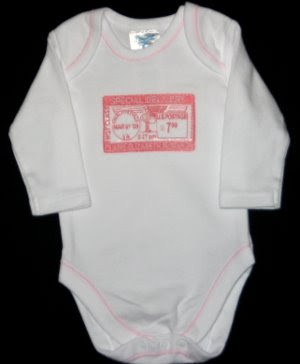 Beth ordered a Special Delivery onesie for a relative... check out the city name!! 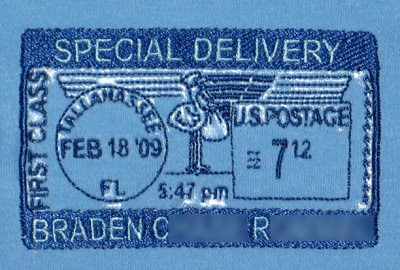 I'm pretty impressed how well that tiny "Charlottesville" stitched! 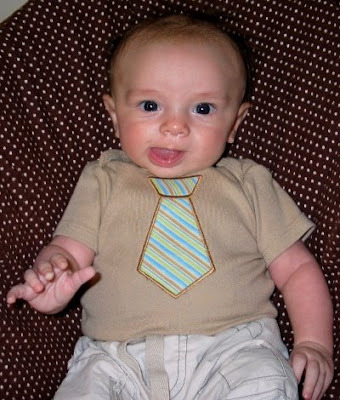 All dressed up for church! 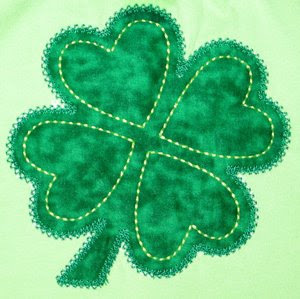 The embroidery design is from GG Designs, and stitched beautifully! 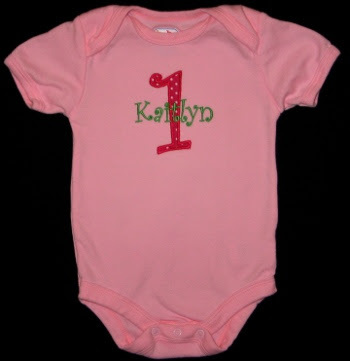 Marcy's little girl is turning one and she asked me to personalize a couple items for Kaitlyn to wear at her party. 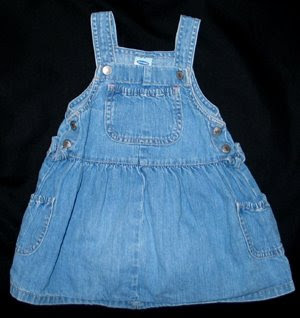 First is a cute A-line dress made by Marcy's mother-in-law. She had already put the cupcake on it, I simply added her name. 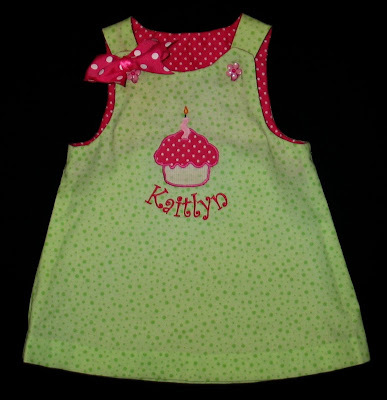 This dress is too precious to risk getting messy, so Marcy also asked me to stitch a onesie for Kaitlyn to wear as she eats her cake. Marcy had used the Curlz font for her invitations and party hat, so we stuck with that theme. 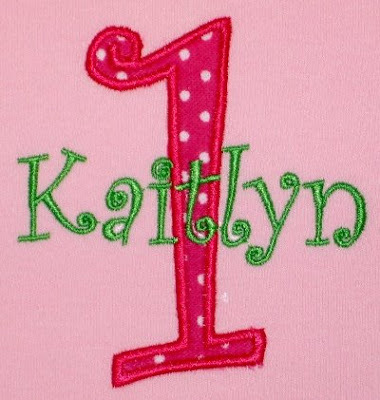 Kathy digitized the "1" for me, and I added "Kaitlyn" with Embird Alphabet #17. 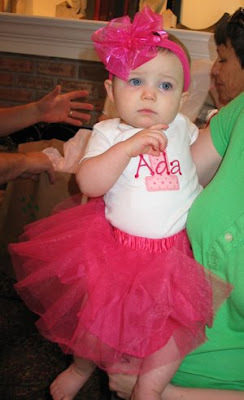 And here she is on her special day with a cute tutu! 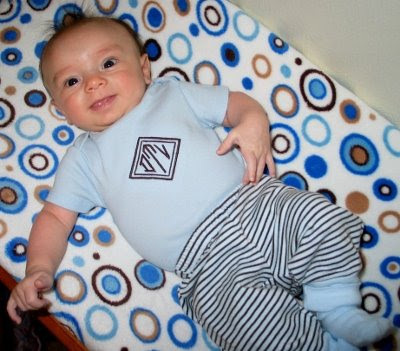 I monogrammed this solid light blue onesie (from Target, Circo brand colored onesie pack) to coordinate with the striped pants, which came with long sleeved onesies that are too warm to wear now. 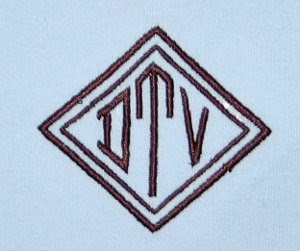 The monogram is from Cactus Punch Monogram Vol. 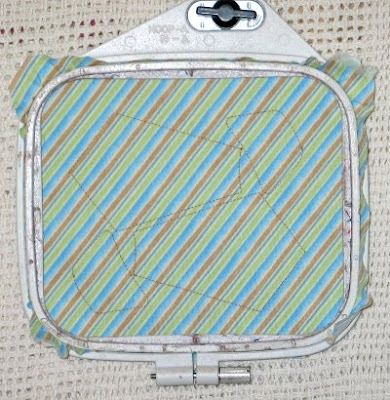 1; when I saw the double diamond frame, I knew immediately it was what I wanted to go with those stripes! Rachel enjoyed having a special first birthday shirt for Tre to wear at his party, so she asked me to make something special for her little friend Kate whose first birthday party is today. Kate's party is a farm theme. I sent Rachel a link to some cute farm designs I have, but we couldn't figure out how to incorporate the fact that it was her first birthday into those designs. So I told her what I was doing for Ada. She liked that idea and we decided to look for some farm-themed fabric for the applique. Most of the farm prints I found had a motif that was too large to fit in the "1". I bought the cow print thinking it was pretty cute. Rachel agreed, but wasn't sure what color shirt to use, since we wanted to use red for her name. This is where J.J. (her husband) steps in on the scene. 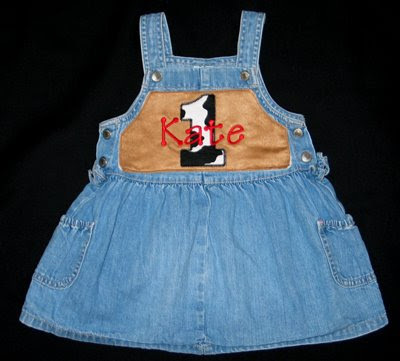 He thought it would really be cute to put the cow print 1 and red-lettered Kate on the front of a pair of overalls. I thought denim was a perfect solution for the background of our design! 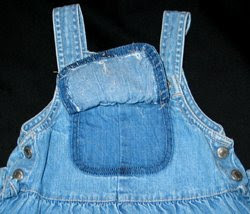 It is very hard to find little girl denim items that do not already have embroidery on it. I stopped by our local used clothing boutique and was thrilled to find this Old Navy jumper with no embroidery! The plan: take off the pocket, embroider the design, and ta-da! Adorable outfit super quick. I guess all the fading took place after the jumper was constructed. Now it was going to be WAY obvious that a pocket had been there. So I emailed Rachel with my bad news that this jumper wasn't going to work and we needed a new plan. (We are now down to under a week left before the big party). Creative J.J. saves the day again. He suggested stitching the design on some suede and appliqueing that onto the jumper, covering the whole top panel. I thought that was yet again another great idea. Rachel bought the suede and I got to work. Here's the final product, and I think it turned out really cute! 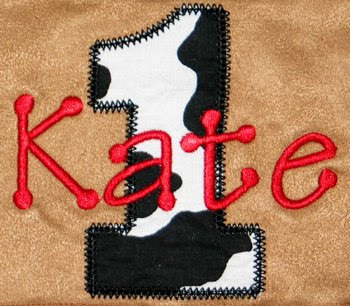 As in Ada's design, the "1" is from GG Designs' Chubby Wubby Applique Numbers and "Kate" is stitched with Tinker Toy from 8 Claws and a Paw. Rachel got a red shirt for Kate to wear underneath the jumper. If I get a picture of Kate in her jumper, I'll add it later. Throughout this process, Carlin said I may have to change my blog name. 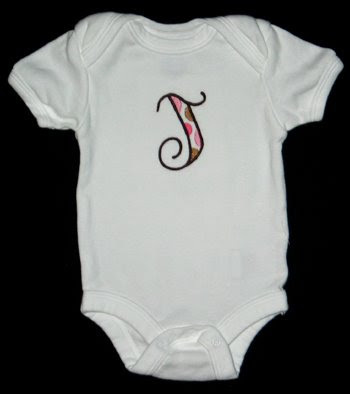 Maybe "Stitched by Janay, Inspired by J.J." ?? He's one of the creative mind behind Jackson's crayon tool belt. These two keep me on my toes, that's for sure. Next time I'm faced with a stitching dilemma or need inspiration, I'm calling J.J.! 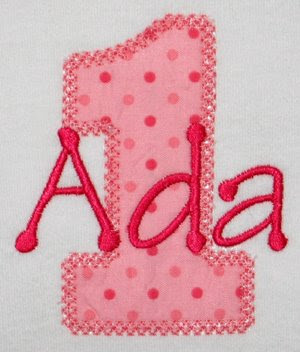 Today is Ada's first birthday! 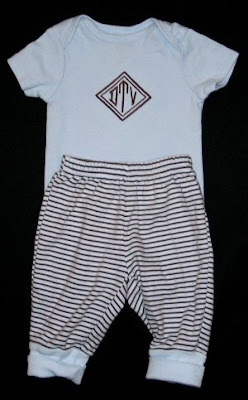 Sara asked me to stitch a onesie for her to wear at her party. She already has a hot pink tutu (SO CUTE! 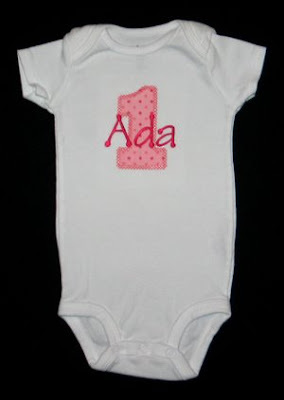 ), so she wanted a matching top, with an applique "1" and her name stitched across it. 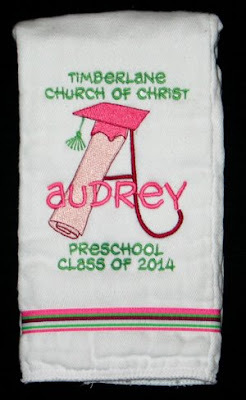 I bought the Chubby Wubby Applique Numbers from GG Designs. Sara picked the fabric and thread from my stash. After looking at several font options, we settled on Tinker Toy from 8 Claws and a Paw. I thought it was a perfect match with the fabric. HA! Isn't that so cute?? The monogram is Five Star Font's Diploma~Graduation Monogram. Picking that was the easy part. The challenge was finding the font to match the logo on the school shirts and tote bags. Let me introduce you to an awesome online resource: WhatTheFont.com. Upload an image of the font you are trying to find. Instantly you are provided with a list of possible matches from their huge database. If your font isn't found that way, you can post a picture on their forum and let the experts take a swing at it. I posted an image there and within a very short time someone replied with a suggestion that led me to “Hog Bold HMK”. I sent Kathy the link to download it, and she digitized all the text for me (which stitched beautifully, thanks)! 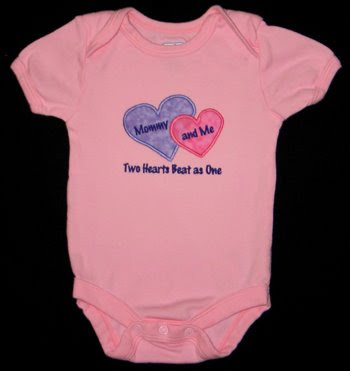 Tammy had a vision in her head and asked me to create a onesie for her granddaughter. 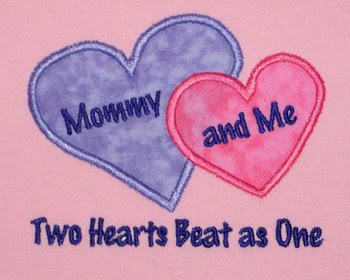 The applique hearts are from Designs by JuJu's Simply Hearts Applique set. I added the text with Embird Alphabet #8. 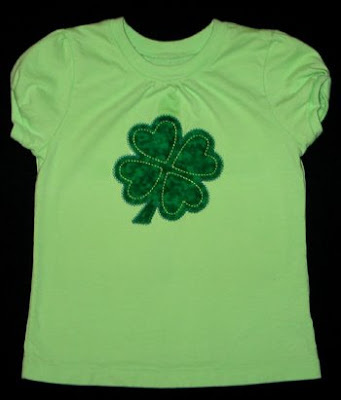 I didn't get around to it until Saturday morning, but I did get a shirt stitched for Annaliese for St. Patrick's Day. I had a lime green shirt that she's about to outgrow anyway, so I picked a quick-to-stitch design that wouldn't be so time intensive that I'd feel like it was a waste. 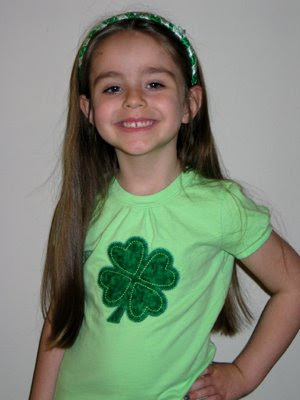 It turned out pretty cute, and she got to wear it on three occasions, so all around a worthwhile project! The design is from Embroidery Boutique. Again, I stole the great idea from someone else. Before stitching I consulted my resident Superman expert, who wanted the symbol to look like Christopher Reeve's cape in the Superman films. I added the text with Embird Alphabet #2. 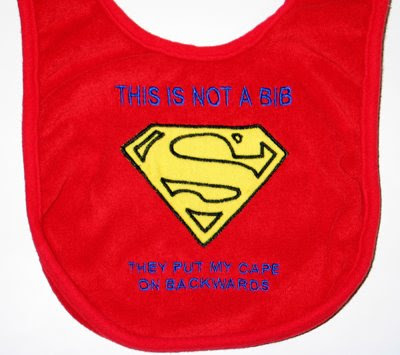 Here's Dashiell in his bib, err... cape. See, he's not impressed it's backwards. 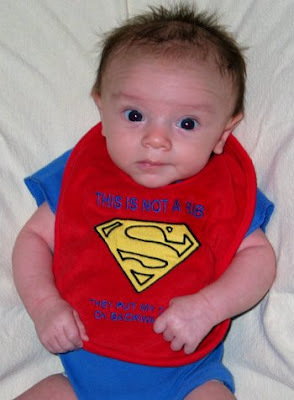 And here is Dashiell with Superman, who by the way, thought it was the coolest bib ever, as did everyone else that saw it. 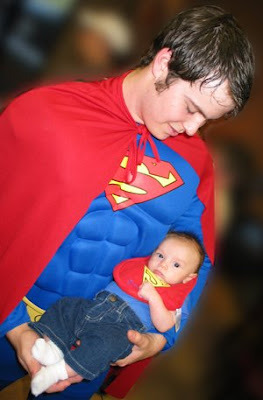 You can see more pictures of our Superhero Night on our family blog. 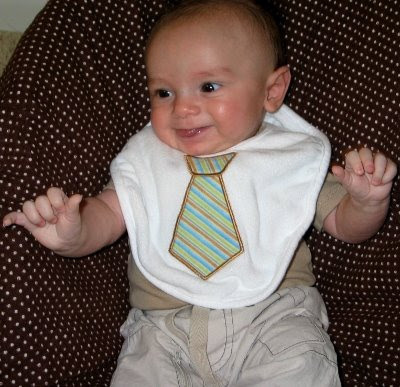 I've been going to a breastfeeding support group once a week since Dashiell was four weeks old. Our little guy was slow in gaining weight, so it's been important to get support from consultants, other moms, and monitor his weight. (You can read more about that situation on our family blog.) While there another mom and I have been swapping stories. Her poor little girl was suffering from reflux and other issues. She had tried several formulas before discovering her daughter was allergic to dairy and soy, so she needs a special formula. This of course happened after purchasing TONS of formula online by the case which cannot be returned. It's the brand we are using to supplement Dashiell's intake, so she gave it all to me last week! God is so good, pairing us up at just the right time. 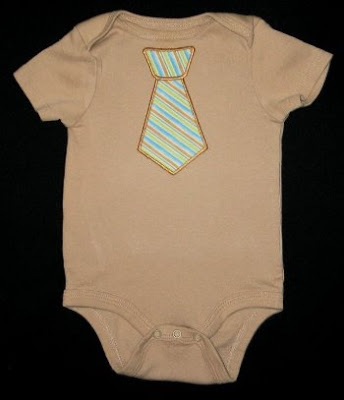 She wouldn't let me compensate her, so I stitched this baby gift set and gave it to her this morning. 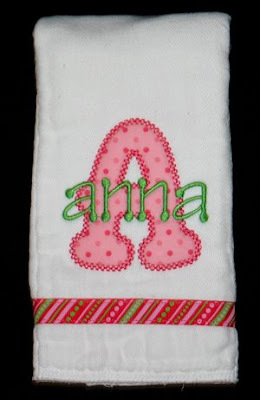 The capital A monogram is Vintage Applique Alphabet from Embroidery Boutique. I added "anna" with the Tinker Toy alphabet from 8 Claws and a Paw. Melinda and Melanie go crazy! 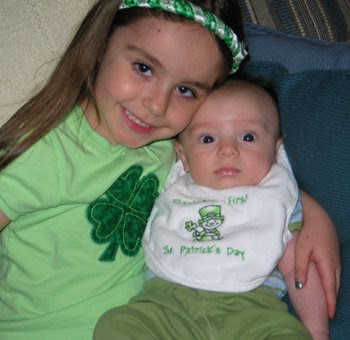 In October Melanie gave birth to a little boy. She had seen some of my stitching with the other moms/babies at church, but my gift to Jaeson was her first hands-on experience. 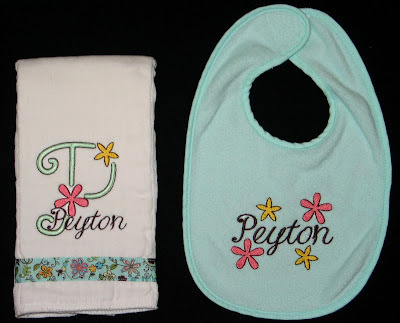 :) She and her mom Melinda had a shower to attend, so they both placed orders since they loved Jaeson's personalized stuff so much. 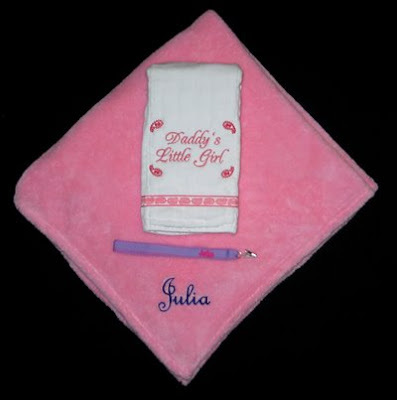 I did lots of stitching for baby Julia last week! 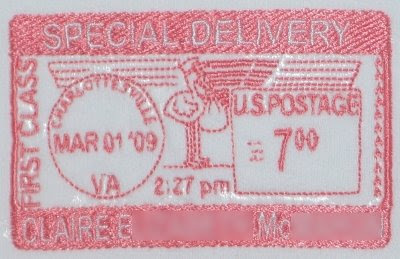 The monogram is Whimsy Dots by Five Star Fonts. 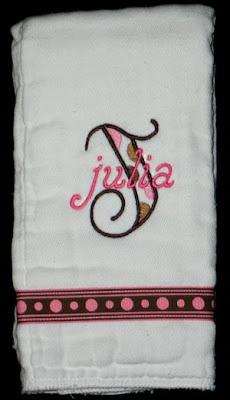 For the bib I just stitched "Julia" and added the dot frame. 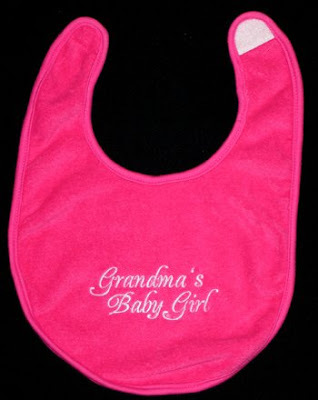 In addition to that set, Melinda also requested a bib to honor Julia's grandmother (a close friend of Melinda). I used Embird Alphabet #38 for the text. 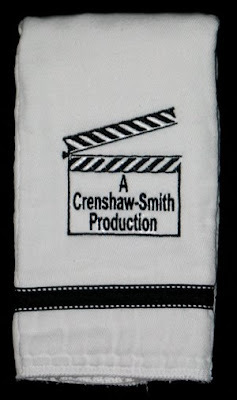 ...and a Production burp cloth. I added the text to the clapboard design using Embird Alphabet #2. I love how this black and white ribbon looks like film! First she had me monogram a blanket she had purchased. She picked Frenchie alphabet from 8 Claws and a Paw. 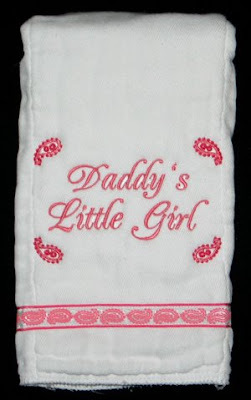 She ordered this burp cloth like Ada's and Chloe's. I stitched "Daddy's Little Girl" with Alphabet #38, and added paisley designs (from a frame from AK Designs Boutique) to go with the ribbon. 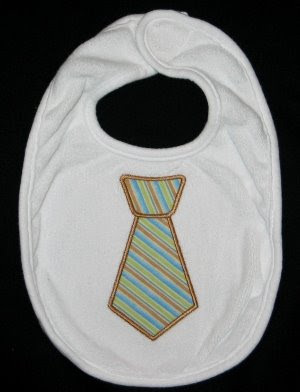 A month ago I posted three of the five baby gift orders Michelle had placed. Here are the other two. 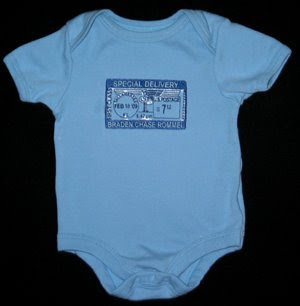 First, a Special Delivery onesie for a coworker who had a little boy. The design is from Sew Terific. 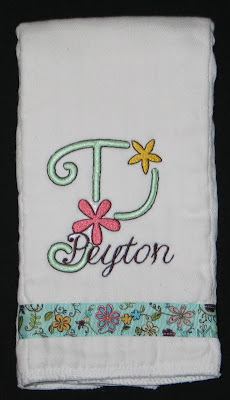 I used the Flower Power monogram from Julia's Needle Design. 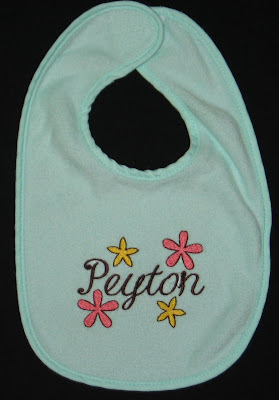 "Peyton" was added with the font "Riva LET" digitized for me by Kathy. 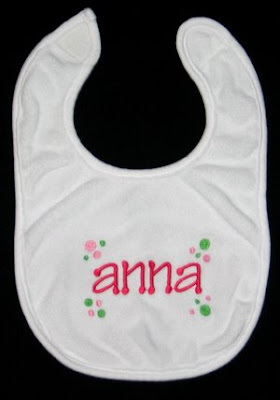 For the bib I stitched her name using the same font, and stole the flowers from the monogram. I was thrilled to discover I had a bib that matched that ribbon perfectly!